I’m going to be honest: I like BeaverTails (cinnamon and sugar BeaverTails, to be specific) far more than I should probably admit. There’s not a whole lot to them — it’s just a big, flat piece of dough that’s deep fried, buttered, then dipped in a mixture of cinnamon and sugar. That’s it. Crispy and crunchy in spots and fluffy in others, combined with just enough cinnamon and sugar to make it sweet but not cloyingly so, it’s so damn good. I can’t resist it. There are other, similar fried dough options (mini doughnuts, churros, etc.) but BeaverTails are king. There’s just something about the irregular shape of the dough, which gives it textural contrast, that makes it irresistible. 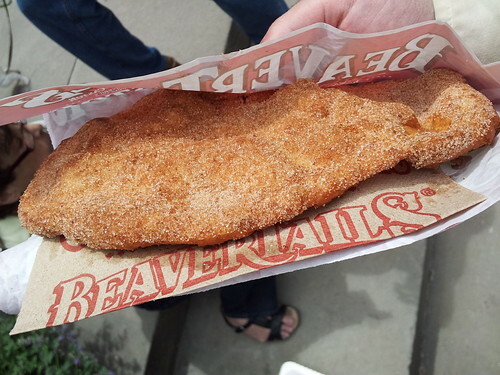 I’m actually glad that there’s no permanent BeaverTails outpost in Toronto, because I’d be eating there all the time. I would live there. They would know me by name. I would die of a heart attack within a couple of years. It would be a life well lived.